Stick incense that is not as sweet as Green Rose, but sweeter than the Indian Temple brand incense. 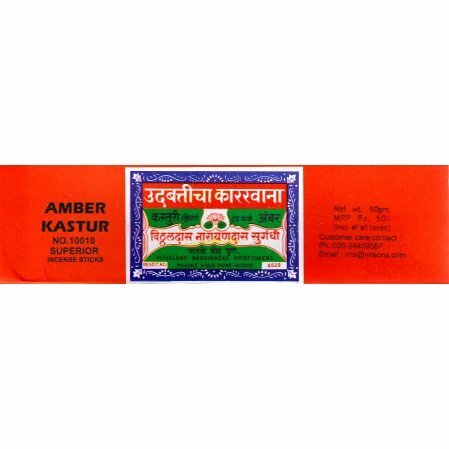 Also known as Amber Kasturi 10010. Our #2 best-selling incense, now back in stock. Not as sweet as Green Rose, but sweeter than the Indian Temple brand incense. available in a 20 grams size or 50 grams with sticks, about 8.5 inches. If we can, we'll ship the incense with your book order, and charge the first class mail charge for the incense. The incense charge will thus be higher than estimated by shopping cart. I ordered a hard to find product and it was shipped quickly. Very Happy! It has been my pleasure to purchase this incense from Vedanta since the 1980s. It is consistently even and brings such as pleasant memories nd deepens my practice. It is not harsh, irritating to my neighbors and when I go to Mexico my friends there ask for me to bring them some. It is perfect to pack, easy to use and a delight. A lovely fragrance with a 'classic', almost nostalgic appeal. Thanks also to Vedanta for the excellent service.